Hey guys...I know I am WAAAY overdue for a proper blog post...bear with me and I should be able to squeeze one out sometime this week. I do have a few thoughts on the use of various wide-angle lenses for landscape photography after our recent stint in the Drakensberg mountains...so watch this space! Meanwhile, here is one dug from the archives of a 2010 trip to the Kgalagadi Transfrontier Park, South Africa. 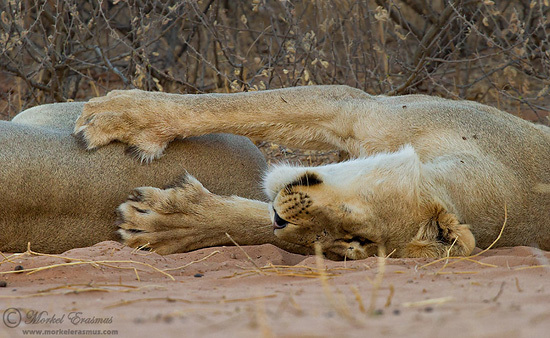 A pride of lions were just waking up for the night, and this female was scratching the back of her sibling. The low angle was possible due to their relative position to ours on the dune they were lying on.